Riding my townie bike around Denver, Colorado lately reminded me of the old rusted out beach cruiser bike my brother Tom found for me last fall. That bike is sitting at his house near the beach in southern California. 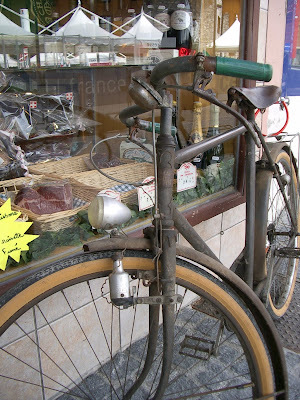 I then thought of this old bike I saw sitting outside a shop in Vallorie, France. A town located between the Col du Telegraphe and the Col du Galibier in the French Alpes.